Hope you can check out tonight’s Moheak Radio Music Meeting, where we rate and debate important new indie releases. Special guest will be Jeremy Dawson of Shiny Toy Guns. I’ll also be joined by Moheak’s Mo Herms and Larry G. We’ll be on webcam, so you’ll be able to listen and watch. 8-10p Pacific, 11-1a EDT, 4-6a GMT. There will be an updated post , which will mention the tracks that got the best reactions. http://www.moheak.com. Chick listen live. Late night update: All songs well received, with new Dum Dum Girls, The Features, Ursula 1000, Sleeper Agent, Raveonettes, Friends, and Teddybears doing the best. 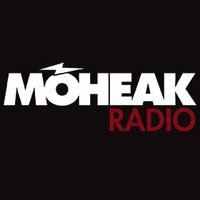 Here are links and the playlist from yesterday’s Go Deep show on Moheak Radio. It airs every Friday from 1-3p Pacific, 4-6p EDT, 9-11p GMT. Hourly links at 128 are available for downloading or streaming ,just below. Here are the guests for Sunday night’s Moheak Radio Music Meeting. Shiny Toy Guns‘ co-founder and synth player Jeremy Dawson, along with Moheak Radio DJ’s Mo Herms and Larry G. Listen and watch 8-10p Pacific, 11-1p EDT, 4-6a GMT. Thanks to The Features for their epic live performance at our Moheak studios a few hours after my Go Deep show! The Horrors came to America, fresh off of their triumphant Reading & Leeds festival appearances in England. NME Magazine ranked their sets as top three among non-headlining bands. Feeding positively off of their most accessible album to date, the band sold out the El Rey and treated us to a tight, powerful set that brought visions of live Interpol and Simple Minds. Their “Still Life” single closed the set and was the highlight. Kudos to their lighting person, who delivered the darker but warmer colors. Teddybears played at the Echoplex the same night. Their Devil’s Music is one of my fave albums of 2011, and their live shows are a party. 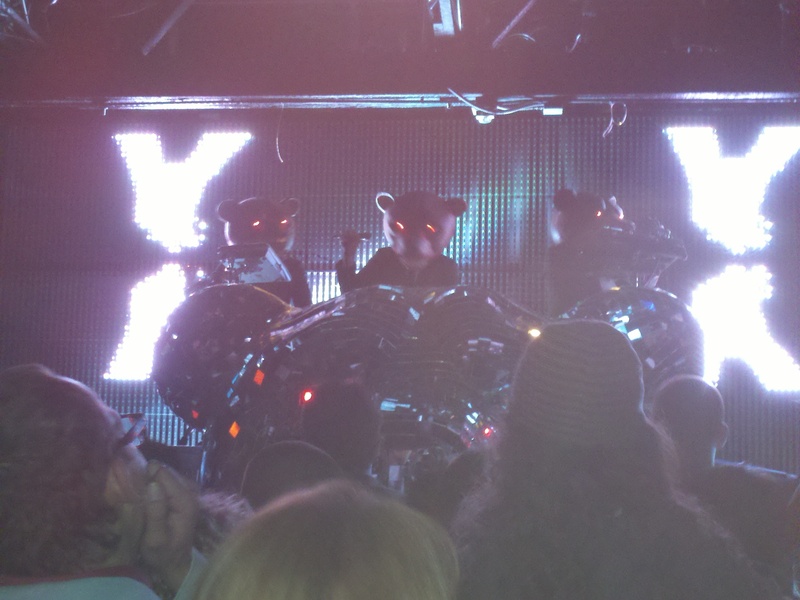 As always, they were adorned by their famous Teddybear masks (see above). Must have been real hot for them, especially with suits on. The event was an energetic dance fest as expected. A disappointment was that the songs were remixed versions rather than sounding like the originals. While in New York, I hit the Mercury Lounge for Hunx & His Punx. This camp band is a hoot, with a fun 60’s vibe and a theatrical stage show. Singer/leader Seth Bogart told us how drunk he was. The dude was playing in New York so why not enjoy himself, right? The band and backing vocals were pretty much all over the place so my guess is that they’d been drinking right along with him. Let’s just say that I saw Hunx and His Drunx. I probably didn’t see them at their best, but they were fun. Here are links and the playlist from yesterday’s Go Deep show on Moheak Radio. It airs every Friday from 1-3p Pacific, 4-6p EDT, 9-11p GMT. You can download or stream at 128 by the hour. The Moheak Radio Music Meeting, where guests and I “rate and debate” important new releases, will return next Sunday evening (9.25) from 8-10p Pacific. Here are links and the playlist from yesterday’s Go Deep show on Moheak Radio. It airs every Friday from 1-3p Pacific, 4-6p EDT, 9-11p GMT. Hourly links at 128 are available for downloading or streaming, just below. The talented and cool Ida Maria dropeed by my show on July 1. Here are part 1 and part 2. Enjoy!